Ever need an idea for a style of letter, and wish there was ONE PLACE you could look to find a ton of different ways to draw it?! Me, too. On April 1st (tomorrow! ), I’m teaming up with Emma at @blackchalkco to create just that- on Instagram! 1. TEACH: we want to show you the basic steps to making a letter. Emma and I have each been asked by so many of you to show how do put a basic letter together. So we are going to post a video each day, starting with A on April 1. 2. LEARN: we want to learn from YOU! Beginner or pro, we all have things to learn from on another. We will be featuring (a ton of) your favourite artists daily, showing how they do THEIR style! 3. COLLECT: we want to create a place on Instagram where all different styles of letters can live and be referred to for inspiration! BUT……… WE NEED YOUR HELP! Follow the Letter Archive (@letterarchive) on Instagram, and join us on April 1st in posting a letter a day in chronological order using any tool and style you like. Store it in the #letterarchive using the hashtag! 2. WATCH: daily how-to videos by us, and extras from all your favourite artists! 4. HELP: help us create IG’s largest archive of letters!! It’s simple- you don’t HAVE to do anything to join! 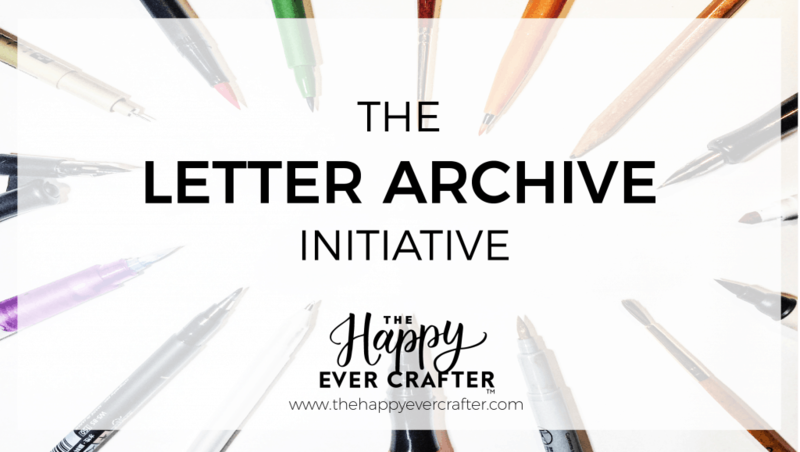 You may have seen some posts that said “I am joining the Letter Archive initiative”, and we totally encourage you to let your followers know you are participating by posting something like that. However, anyone can join at any time! 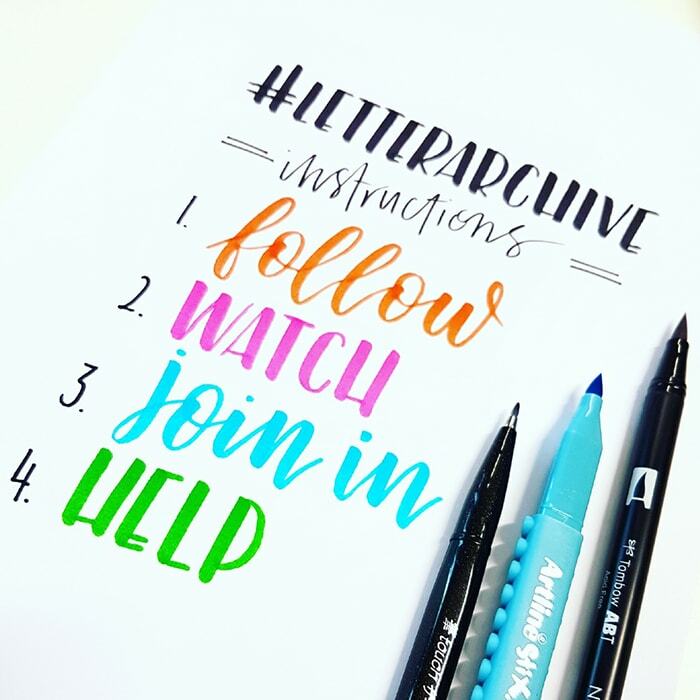 There are no specific rules to join… but you may want to be following @letterarchive, of course. Is this just a one-month challenge? No way! In fact, the Letter Archive is actually not a “challenge” at all. April is simply our kick-starter month, to get as many people as possible putting their style into the archive. We hope to keep it open indefinitely, and keep posting how-to’s and features, so that everyone in the Instagram lettering community can use it as a resource! Will there be a special hashtag for each specific letter? I have done an alphabet challenge before- can I enter my old posts? ABSOLUTELY! Actually, PLEASE do! You can do this by simply adding the hashtag #letterarchive in your caption on the old photo, or by completely reposting it to your account. Reposting it will have it show up higher in the queue on the hashtag page. That being said- please refrain from adding the #letterarchive tag on photos that AREN’T letters. By that we mean full quotes, words, or illustrations. We want to keep the archive as clear and simple as possible for everyone to use! I don’t have Instagram, can I still do this? Instagram is accessible to those who don’t have the app on their phone- you can find our account at https://www.instagram.com/letterarchive/ from any browser. You can go ahead and check out our how-to’s and featured posts, but unless you have your own account, you won’t be able to share your own creations with us. What supplies can I use? Does it have to be calligraphy? This is the best part- you can use ANY lettering supplies you want! It does not have to be calligraphy- we want to see as many possible types of hand lettering we can find! The more unique styles we can get in this one spot, the better! I don’t think I’m good enough to add to the archive. We don’t agree!! EVERYONE is encouraged to post to the archive… there is nobody else in the world who has the exact same style as you! That is the whole spirit of this archive- to gather as many unique styles as possible. There is absolutely no “right” or “wrong” style here… just different! This is also an amazing opportunity to post your work and gain feedback from others- you will surprise yourself with how quickly you will learn new tips and tricks from that! I don’t think I’m ready for letters yet. Is this OK for beginners? This initiative is meant to be inclusive and useful to beginners and experts alike. For the whole month of April, we will be posting super basic how-to videos on how to properly build a letter. This is meant to be valuable for beginners, who see lettering videos but still can’t seem to get it right. Follow along, ask questions, and take this opportunity to give yourself that push! How do I get “featured” like the other artists on there? At the end of every week, we will be showing a collage of posts that were shared that week. To ensure that yours are seen, make sure your profile is set to “public” in your settings! The artists that are featured are approached by us. If you would like to be featured in the future, please feel free to send us a DM on Instagram, or contact @thehappyevercrafter or @blackchalkco directly! I have a question about lettering and I’m not sure who to ask! I’m a very new beginner and want to improve my lettering. My question is this: how to all the amazing people I’ve been seeing on Instagram know all these different fonts? Are they their own creations? Do they have Instagram boards purely of fonts that they choose for inspiration? Help! All of the amazing people on Instagram can be both totally inspirational and totally discouraging at the same time- we’ve all been there!! Yes, they are all their own creations, and everyone draws inspiration from different places! Once you’ve learned the art and practiced (A TON!) you start to learn what comes naturally to you as "your style", and kind of tweak it once in a while when you see another cool technique you like. In my experience anyway, that’s how it happened! My suggestion would be to find a "beginners" modern calligraphy course, follow some beginner accounts (check out @letterarchive- we’re doing breakdowns of each letter daily!) and practice the very basics before you get too stylistic. Then once you’ve mastered those basics, keep an eye out for little things (flourishes, swooshy things) that your eye is drawn to, and try to mimic them on your own letters.